Few months ago a family member showed me her newly done tattoo- a Koi. Having always been fascinated with this fish, she was so overjoyed when she finally did it, that she managed to spark my interest and curiosity. Intrigued I searched for the meaning of this tattoo and fully understood why she chose it- it matched perfectly with her. Chinese legends tell us how the proud and courageous Koi (a type of carp) fought against the raging currents of the Lung Men (also known as Dragon’s Gate) on the yellow river with the promise of being transformed into a magnificent dragon. These brave fish fought for their intense desire to evolve into a vibrant dragon due to their extreme perseverance and determination. 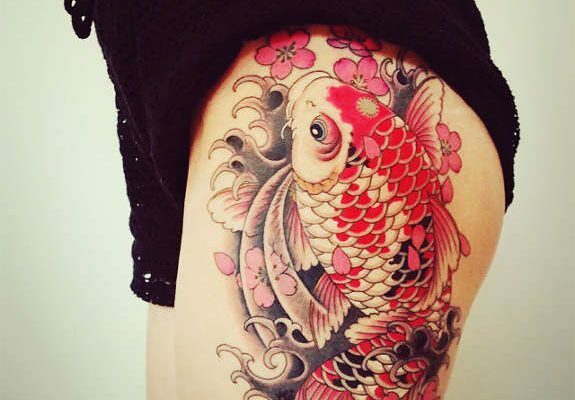 Generally, Koi tattoos stand for good luck, aspiration to achieve your desires, success and intelligence. They are ideal for individuals who are both strong willed and motivational- who stand their own ground and are ready to fight with perseverance to achieve their goals. 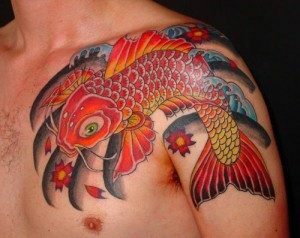 Having said that, there are different meanings for Koi fish tattoos, some of which are maybe less common in color. Black Koi: usually stands for ‘overcoming successful change’. The black Koi is perfect for someone who has fought through pain and adversity to reach the place they are in now/would like to be. Red Koi: red symbolizes energy, strength, love of a strong masculine nature, bravery and power. Blue Koi: stands for strong masculinity, peace, tranquility and calmness. 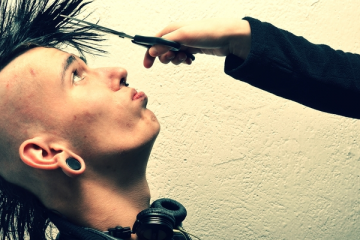 At times also associated with reproduction. Gold Koi: serves as a symbol of wealth and prosperity- perfect for someone who is focus minded and driven to succeed. White Koi: advancement in social settings related to career and family. Koi with Hibiscus: represents undying devotion and loyalty for something or someone you love/loved. Koi with Lotus: The lotus with the koi symbolizes that with struggle and determination, success is inevitable.